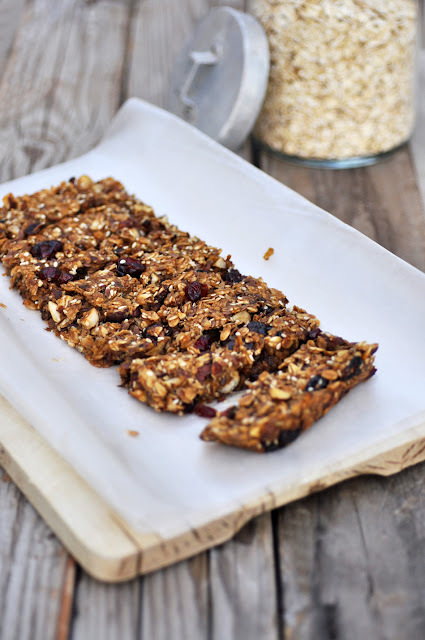 Granola bars are very popular if I can believe the statistics of my blog. Therefore, I cannot withhold this granola bar recipe any longer that got me through the last couple of weeks of my marathon training. As you might also know, I have run the marathon last Friday in an amazingly good time that had me over the moon for three days or so. I have been following a 12-week marathon training program that included speed training and the regular long runs up to 36k. I have been eating well and tapering down sensibly the last few weeks before the race. My finish time last year was 3:58 which I wanted to reduce to 3:45 this year. That was my goal. It all came together in the end. I ran the race sensibly, and by the book. I kept in mind that I should have negative splits (running the first half slower than the second half), and so I did. I finished the marathon in 3:35:40 with split times of 1:50 and 1:45. It took me literally three days to believe it myself that this was MY finishing time. Something that I didn't dream of in my wildest dreams. Only now I have returned to reality and everyday life, and am ready to share recipes and stories again. I will write a comprehensive recap of the marathon next couple of days incl. what I ate the 3 days before the race. Today's granola bars are not only good for marathon trainings. In fact, I just baked a new batch this afternoon. It's the perfect mid-morning or afternoon snack for kids and adults with the right mixture of sweetness, crunch and chewiness, that will satisfy any hunger pangs between the main meals in the moist nutritious way possible. Preheat oven to 160C/325F. Line wide loaf tin with parchment paper. In a large bowl, combine oats, nuts, coconut and sesame seeds. Set aside. In small bowl, combine mashed banana, molasses, oil and vanilla. Add wet to dry ingredients and stir until well combined. Stir in cranberries. Transfer batter to prepared loaf tin. Bake for about 40 minutes, or until top is golden brown. Let cool completely on wire racks. Cut into bars. Keep refrigerated or freeze for up to a month.